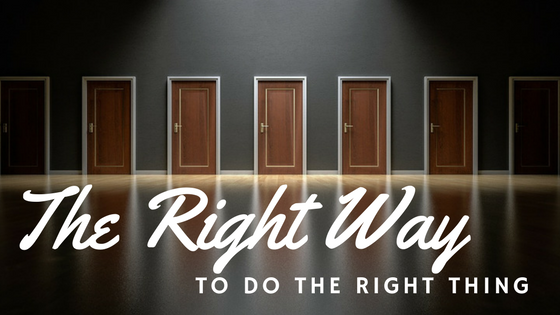 There is never a right way to do the wrong thing. There are, however, wrong ways to do the right thing. This is sometimes the manner in which we can step out of God’s will. Attitude makes all the difference! My thoughts go back years ago when I was in the middle of a difficult situation, like the Monkey-In-The-Middle. I have thought of this advice many times over the years and have passed it on to others. Unfortunately, I sometimes struggle with this tripping point. I’m not alone. Abraham clearly received a promise from God. Sounds clear enough! But Abraham was already a senior citizen and his wife, though very beautiful, was barren and beyond childbearing age. Time wasn’t just running out; the clock struck midnight and the battery was dead. Prayer is a good thing! A really good thing! Jesus gives us an illustration of how we can even pray in the wrong way. You would think in this place of prayer we could at least get things right! Attitude makes all the difference! Pride may work for the master rooster guarding his brood, but not much further. The Samaritans rolled up the welcome mat before Jesus could cross the border to make entry. Even the disciple known as the Apostle of Love wanted to BBQ them on the spot! Surely defending the Lord Jesus is worthy of drastic measures, right? Well, maybe not! Fortunately there is also a right way! When we are walking in the center of God’s will with godly attitude there often develops an ever widening circle of influence and blessings. Even in the most difficult of situations, when we seek God’s heart and His wisdom, He will give direction. Staying in that sweet spot of favour can be incredibly scary and amazing all at the same time. Who knows what paths might open up, if one is willing to do the right thing in the right way! If you want to read more try these?